Today I’m pleased to introduce you to author Jane Kohuth, who graciously answered my questions about her writing life. 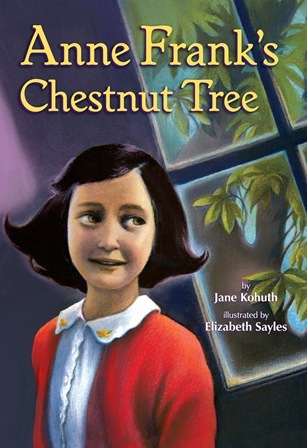 But first, a big congratulations to Jane on the release of her fourth book, ANNE FRANK’S CHESTNUT TREE. Random House generously shared a copy with me so that I could pass it along to one of you! Winner will be chosen at random from among followers of this blog (thanks for following!). Hidden away in their Secret Annex in Amsterdam during World War II, Anne Frank and her family could not breathe fresh air or walk under the blue sky for years. But through an attic window, Anne could see the branches of a tall chestnut tree. This small glimpse of nature gave Anne hope and courage. It inspired her writing, which in turn has inspired the whole world. JANE SAYS This book has been the biggest writing challenge I’ve faced so far. How could I tell Anne Frank’s story for the youngest of independent readers? How could I honestly depict Anne Frank’s sadness, fear, and hope? For me, Anne’s devotion to nature, and in particular to the chestnut tree that grew outside the Secret Annex, was a way to delve into her story that I hadn’t seen before. I hope that I have done justice to Anne’s ideas and beliefs and that I’ve presented them in a way that is both truthful and accessible to young readers. NT: What was the first ‘favorite’ book you can remember? JK: There is a “famous” story in my family about my preschool entrance interview (I was two-and-a-half at the time). My mother took me to meet the principal, and I introduced myself as Frances and my baby sister as Gloria. I was pretending, at the time, to be Frances the badger from the classic books by Russell Hoban. So the Frances books are the first favorites I remember (Bread and Jam for Frances in particular) and are still favorites of mine now. They are so true to children’s emotions and dilemmas at that age. They are quite a bit longer than most picture books published now, and yet generations of children have enjoyed them. I think we underestimate children’s ability to concentrate on longer stories these days. NT: What’s your go-to genre when reading for pleasure now? JK: I don’t have just one! I read across genres and age groups. I read children’s books for professional reasons, of course, to see what’s being published and to learn from the best, but I also read them because I love them. I read more fiction than non-fiction, though I have become a big fan of non-fiction picture books. I read board books through Young Adult literature, and I love realistic fiction, historical fiction, as well as some fantasy and science fiction. For my grown-up pleasure reading, I gravitate to literary fiction (favorites include Atonement by Ian McEwan, A History of Love by Nicole Krauss, and The Handmaid’s Tale by Margaret Atwood), and I like certain science fiction as well, in particular books by Connie Willis. I try to keep learning about my craft and about things that interest me, so I also read books about literature and writing, as well as non-fiction on topics that fascinate me. NT: Did you feel that things got “easier” after your first book was published in terms of finding publishing homes for the books that followed? Is it like dominos, or does each book have to fight for its place in the world? JK: It did get a little easier for a while after I received my first book contract. I had an agency interested in representing me at the time, and getting the contract was what it took for them to sign me. I then sold two more books fairly quickly. But even in a few short years, it seems like the publishing world has gotten ever more skittish about investing in writers who aren’t bestsellers out of the gate. Selling picture book texts, which is my area, is especially hard. And even when books come out, each one is definitely still fighting for its place. It would be lovely to reach the point where name recognition helps sell one’s new books, but I’m not there yet! NT: Now that you have gorgeous books to promote, what is your take on balancing time spent between marketing and writing new things? JK: Balance is hard. I wish I had some insightful advice for other writers dealing with this. My situation is a little different from some, because I also battle a chronic illness, which keeps me from having the kind of regular schedule I’d like, but in some ways I think it’s not so different from people who are trying to balance writing, marketing, and raising kids, for instance. What I’ve found is that I have to focus on marketing and publicity efforts around the time my books come out, and put new writing on hold for a bit. Writers are mostly on their own these days when it comes to promotion, so there’s pressure (internal at least) to do all you can for your books. I’ve tried to reach out online and in store and school visits. For my last book, the picture book Duck Sock Hop, I did dozens of sock hops and other school visits (with more still to come). That takes a lot of energy. I’ve also just started doing visits via Skype, which I think may be a great way to reach out to teachers outside my region and get them familiar with my books. On the bright side, meeting kids and seeing them interact with my books is very rewarding and helpful for me as a writer, and when I do get back to writing, I tend to be very eager, because I’ve been missing it! NT: You have a degree in theological studies from Harvard Divinity School. (Wow, and cool!). How has that influenced your writing life? Specifically, did your time in divinity school play a part in your desire to write your new book, ANNE FRANK’S CHESTNUT TREE? JK: Going to Harvard Divinity, where I got a master’s degree in theological studies (I wasn’t studying to be a minister or rabbi like many of the students) grew out of my undergraduate exploration of gender and religion in my writing. As an undergraduate at Brandeis, I majored in English and Creative Writing and also completed programs Women’s Studies and Jewish Studies. At the time I wrote primarily poetry, and I was exploring themes that I thought would benefit from further education in religion. My advisor recommended I reply to Harvard Divinity, for which I am grateful. I don’t know if I will ever have another intellectual experience so stimulating. Though my published children’s books have not dealt particularly with what I studied there, my education informs my worldview and how I approach my themes. I hope that I will be able one day to publish a book or books for young people that tackle the fascinating role that religion plays in our construction of gender. And my degree did play a role in my coming to write Anne Frank’s Chestnut Tree. Random House was looking for someone to write a book about Anne Frank for their Step Into Reading series and asked me to do it in part because of my background in Jewish history. I think that my background also drew me to Anne’s philosophy about nature and suffering, which plays a big role in the book. NT: Can you tell us a little bit about the interplay between your blog and your author website? How did that transition happen, and would you encourage pre-published authors to carve out a little bit of cyber-space for themselves (i.e. in the form of a blog) before they have a need for an ‘author website’? JK: I created my blog at the same time I created my website. It was and is specifically intended to feed into the News and Events section of my website, so people don’t have to go to two different places to know what’s going on with me! I never intended it to be a daily or weekly blog, mainly because I knew I wouldn’t be able to keep up with it. Instead, I wanted a place to let people know about new books, events I was planning, and to occasionally post about other topics that visitors to my website might find interesting. Before my first book came out I attended workshops about online marketing and tried to learn as much as I could, and found that people overwhelmingly recommended establishing an online presence even before publication and certainly afterward. Most people in the field seem to recommend that authors engage quite a lot online, and I might benefit from having a more regular blog and Twitter presence, but it comes down to priorities for me. I don’t have a particular knack for marketing or social networking, and so I think my time is better spent writing the best books I can. I don’t know that I have anything really good to say on a regular blog, but I do think I may have some great books in me! That said, I am on Facebook and Twitter (www.facebook.com/JaneKohuthAuthor) (@janekohuth), as well as Goodreads, so please do connect! I invite everyone to visit my website (www.janekohuth.com), from which you can link to my other social media profiles and find out more about me and my books. I also do school visits and writing workshops, so if you’re a teacher, librarian, or parent and that interests you, please visit the Author Visits section of my site. If you are pre-published, I’d say it would be a good idea to start reading other author blogs, checking out their websites, and following industry news. Read the Horn Book. Get Publishers Weekly’s free Children’s Bookshelf newsletter. Follow other people on Facebook and Twitter and chime in sometimes. If you think you have a niche that others would be interested in, or if you want the practice, or if you enjoy it, by all means blog! NT: Thanks, Jane, for your thoughtful responses. 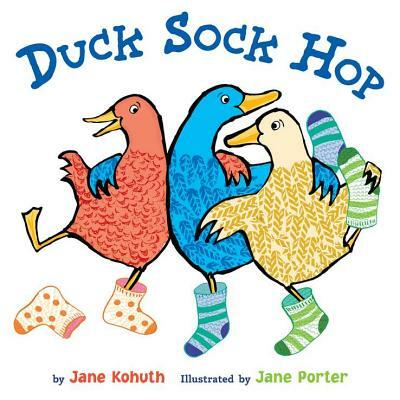 Some of Jane’s earlier publications include DUCKS GO VROOM (Random House, 2011) and DUCK SOCK HOP (Dial, 2012), and ESTIE THE MENSCH (Random House 2011). If you haven’t seen them, check them out! You can now order books signed and personalized by Jane through independent bookstore Wellesley Books! They will ship the books anywhere in the United States. Click here to order. 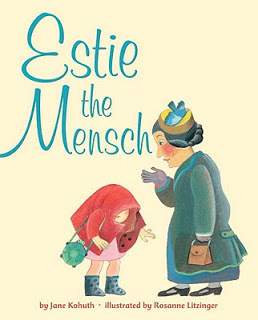 Some other fun places: Cynthia Leitich Smith, Picture Book Reviews, 5 Minutes for Books, and The Jewish Women’s Archive. Nancy Tandon • This entry was posted in Author Interview, Writing and tagged Anne Frank, Jewish History. Bookmark the permalink. 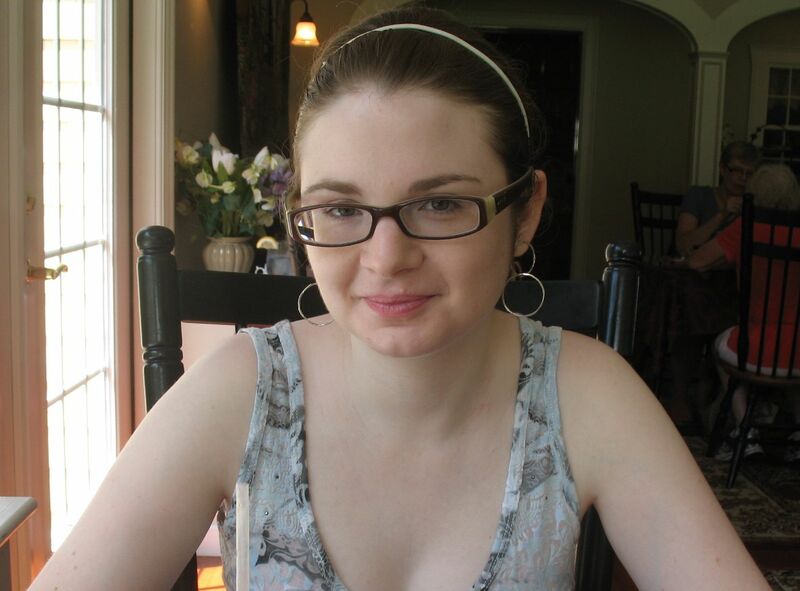 ← Meet Author/Illustrator Hazel Mitchell: A KidLit Pearl! Great to know there is a new book out about Anne Frank for younger generations. I love the cover. Lovely interview. Will definitely check out the book. Thanks, Jessica. �I, too, am always grateful to writers who help to shine light on the process for those of us coming up along behind them!